THE CHAPEL IS CURRENTLY CLOSED UNTIL FURTHER NOTICE. 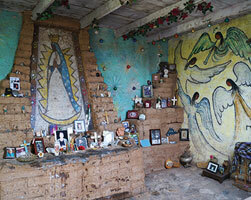 In 1952, DeGrazia built the Mission in the Sun as the first building constructed on the property in memory of Padre Eusebio Kino, a Jesuit priest, and dedicated the mission to Our Lady of Guadalupe. Following his own building plans, DeGrazia and his friends carefully handcrafted the adobe constructed building. 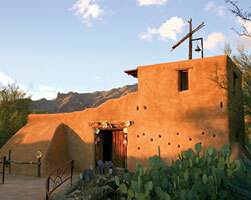 In 2006, the Mission in the Sun was registered as a National Historic landmark. At the altar, a painting of Our Lady of Guadalupe welcomes visitors where they often place photos, candles and mementos. The ceiling of the mission opens to the sky and the walls showcase DeGrazia’s hand-painted frescoes.